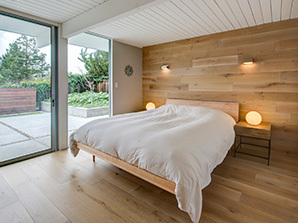 The owners of this original Eichler home came to us wanting to move to a more open floor plan while addressing extensive heating and drainage problems. By relocating the kitchen and dining areas we were able to create a bright and vibrant space. Incorporating new sliding glass doors, windows, elastomeric roofing and insulation addressed the heating issues. 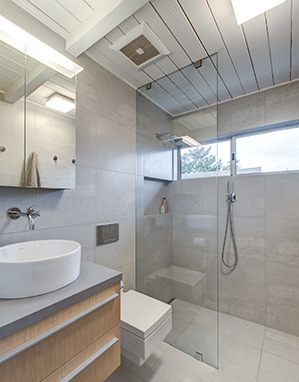 After adding new handmade Heath tile, frameless glass shower enclosures, oak hardwood floors and custom built cabinets the space was transformed. Working with the client and meeting budget expectations, we were able to revive this mid-century classic, into a beautifully efficient contemporary home.